Opening act The Dreaming Spires appear to be the ‘band du jour’ at the moment; cropping up on radio and their debut album getting very nice reviews in the national press; so I made sure I was in the venue early to see what all of the fuss is about. 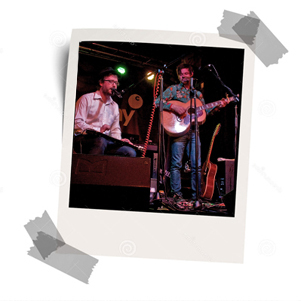 Without their normal band in tow, brothers Joe and Robin Bennett looked quite nervous during their first few songs; of which Super Truth which is the title song from their album sounded impressive; featuring some luscious harmonies from the brothers. The only other song that stood out for me was their lap-steel drenched version of Springsteen’s Atlantic City; as for once in this venue, the sound wasn’t very clear and it didn’t do the Dreaming Spires soft vocals any favours. Perhaps I need to see them with the band after hearing the album. By the time the ever-smiling Mr Prophet ambled onto the stage, the main bar had emptied and hall was packed to near capacity, for the San Franciscan’s third appearance in the area in 18 months and umpteenth in 12 short years. “1-2-3-4!” and the band cranked straight into Play that song again and the Cluny went into full ex-Punk Rock mode. We were only three songs in when the opening bars to Wish Me Luck were recognised and the roar from the 400 fans might have been measurable on the Richter Scale (or possibly not). The smile on Prophet’s face lit up the room as he witnessed the front 100 or so swaying as one. With most songs tonight coming from Prophet’s last two albums, Temple Beautiful and Night Surfer it was nice to hear a couple of new arrangements; most notably Lonely Desolation having a nice Byrdsian jangly feel to it. To some degree; Prophet’s previous band Green on Red, were one of the forerunners of what evolved into Alt. Country and were the first band of that ilk that I ever saw. I can remember that sweaty night at the long lost Riverside Club; as if it was yesterday and Chuck actually name checked the gig tonight. Why have I been a fan that long? 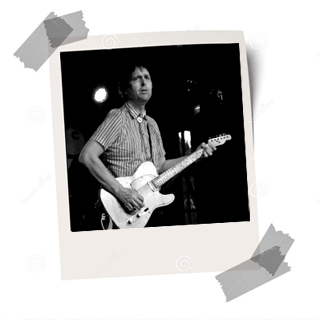 No one comes close to Chuck Prophet the way he combines the sensibilities of Folk Music with the chutzpah of Country and the attitude of Punk Rock and he’s not afraid of a Blues riff either! In other words he ticks all of my boxes. Prophet spent most of the evening playing his trusty Telecaster; only occasionally strapping on an acoustic guitar. When he did the result was invariably passionate and sensitive in equal measures, with They Don’t Know bout Me and You getting for stars in my notebook; and I normally only go up to three. Obviously Prophet is primarily known as a songwriter who sings; but during the duet with the ever-stunning Stephanie Finch Little Girl/Little Boy; his guitar playing was outstanding for a rhythm player. It would be rude not to mention Ms Finch’s moment in the spotlight when she gets to sing the charming Different Drum; which always goes down well with this set of fans. Always the showman; Prophet threatened to ‘stay here all night until we get this thing right’ when preparing the fans for their response to his call on Temple Beautiful. This wouldn’t have been a bad thing for some people; but eventually they got it right and the result was an absolute joy; especially the pantomime booing of ‘Manchester United’ in the chorus. The main set ended with 400 North Easterners being converted to Baseball as we became embroiled first in the story of Willie May and eventually the epic song itself; which is becoming a bit of a signature tune for Prophet. The two encores were so fast and furious I don’t know how he does it, as by the end of Rag Doll I was breathless. Then he cranked through the gears for a Punk fueled Who Put the Bomp; that had 50 or so middle-aged Mums and Dads reliving their teens by pogoing and punching the air. What a way to spend a school night.